A garden water feature adds peace and tranquility to tropical garden designs. 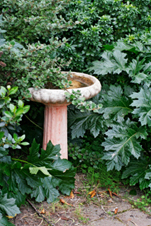 Small features, such as a fountains, or birdbaths, can purchased from a garden or home improvement centers. The supplies needed to build large water features (such as ponds, waterfalls, and streams) can be purchased through specialty stores and websites. Depending on the size and installation requirements of the water feature, you might consider hiring an experienced contractor. Most professional landscape design firms offer free consultations, and will help you decide on the best water feature for your garden and landscape. Landscape water features can be large or small, simple or elaborate. They bring peace and tranquility to gardens and landscapes. Choose a feature based on the style of your garden, home, and landscape. Garden Water Features – What Are Your Options? Water gardens or ponds add peace and tranquility to gardens and landscapes. Ponds can be formal or informal in shape. Formal ponds are typically geometric in shape - square, circular, rectangular, or a combination. They can be level with the ground, or above-ground structures. Informal (or natural) ponds have a free-form (abstract) shape that resembles the look of natural ponds and lakes. Garden Water Falls can be easily added to virtually any garden design. Waterfalls typically spill into a water garden, pond, or pool. If space is limited, or child safety is a concern, a pondless waterfall might be the solution. Pondless waterfalls can be purchased in ready-to-install kits, or built from scratch. Outdoor garden water fountains add the sight and sound of flowing water to gardens and landscapes. They make an eye-catching design focal point for garden and landscape designs. Water fountains are typically one of three types: spray fountains, cascading fountains, or statuary fountains. Spray fountains (usually water nozzles or jets) spray streams of water in different patterns. Cascading fountains consist of one or more levels. Water cascades or falls down each level. Statuary fountains are usually free standing sculptures used in formal garden and landscape designs. A garden water wheel adds the relaxing site and sound of water your outdoor retreat. 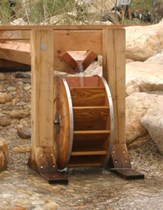 Water wheels are available in pre-assembled kits, or can be custom built to your specifications. Are you looking for an inexpensive, yet attractive water feature that requires no installation? Garden Bird Baths are the perfect choice. They can be easily added to any garden or landscape. Garden bird baths attract a variety of birds and add the relaxing element of water to your front or back yard. They are available in a variety of styles and materials. Some are equipped with heating elements the keep the water from freezing. Solar bird baths use solar panels to harness energy for powering a pump used for circulating water. Water features are a versatile landscape element. Where you decide to place them will depend on the design of you garden or landscape. Use large garden water features (waterfalls, ponds) to create a focal point in the overall landscape design. Consider the view from a window. 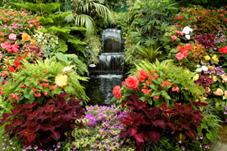 A water garden, stream, or waterfall can be enjoyed while indoors if placed in the right landscape location. Small features, such as fountains and birdbaths, can be used as accents in gardens, or placed on a patios, decks, and porches. Place near an area used for socializing and entertaining to add the site and sound of water to outdoor celebrations and events.